Democrats’ war on rural Colorado is nothing more than a smash-and-grab job for their “green energy” cronies already fattened-up by government subsidies. How else can we interpret what The Colorado Observer reported – that under the rural renewable energy mandate passed last year hydroelectric power is not considered a source of renewable energy? While we strongly disagree and think it is an unfair dictate for Denver Democrats to jack-up the prices on rural Coloradans’ electricity rates, we know that the enviro masses think they are doing the right thing by crusading for clean energy. But, legislators…. With this new revelation, in which water and hydropower have been grouped with oil, gas, and coal, we can only see this bill as a way for Democrats to fatten-up their environmentalist cronies off the backs of hard-working, rural Coloradans. Democrats rejected a Republican-sponsored bill last week to add all hydropower to the state’s renewable-energy standard, which includes Senate Bill 252, the 2013 law requiring rural power providers to meet a 20 percent green-energy threshold by 2020. Cronyism at its worst. Let us be clear – if legislators really cared about the environment, hydroelectricity would be included in renewable energy. The fat-cat enviros’ last defense of creating jobs smacks of using spoons over shovels. If they wanted to create jobs at rural Colorado’s expense, why the need to dress it up in green energy? Now, every word a Democrat uttered defending this bill under the guise of slowing global warming rings hollow, and their cries of fighting for the environment smack of disingenuous doublespeak as all they cared about was taking money from rural Colorado to stuff in the pockets of windbags and the sun-stroked. We need to sweep a few D's out of office. Preferably with independent candidates rather than bought and sold R's. But R's would still be better than D's. This was a party line vote. I read the summary version of the "Twelve Reasons to Exclude Large Hydro from Renewables Initiatives." None of them said that large hydro is not renewable. But one of them did say, indirectly, that it IS renewable: "Large hydro reservoirs are often rendered non-renewable by sedimentation." By extension, large hydro reservoirs are, initially, renewable. I understand that advocates for "new renewables" oppose all proven technologies and it is their right to lobby for whatever they want, but calling large hydro "non-renewable" is wholly incorrect and disingenuous. I think that's all we're gonna get, Derek: Crickets. Yes, why is it not renewable? Actually, there is no renewable energy in the universe as ENTROPY RULES as we approach the heat death of the universe. and we could not include Waster to Energy generation? We will need to fight these jack asses on every level. 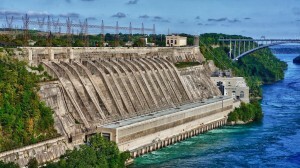 A photo of a hydro power plant on the Niagara river. Is that in Colorado? I think not. But, typically, the CO Peak Politics base thinks its a UN conspiracy. You must feel good about the smarts of your peeps, eh? Maybe they want to invest in gold? Did you hear??? Ft. Knox is EMPTY!! No, in-stream massive hydro is not renewable. We need to throw every Democrat out of office so we can have a reasonable, rational dialog about each and every subject of importance to us………. Democrats are insane idiots on virtually every topic.